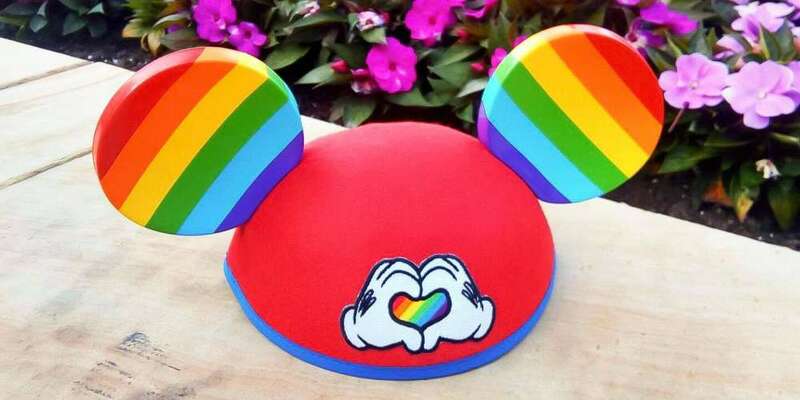 Disney Parks just released LGBT pride Mickey ears, and they’re absolutely adorable. We’ve never wanted something so much in our whole entire lives, and we’re not even huge Disney fans. On social media, we stumbled across the red cap with rainbow mouse ears and a pair of cartoon gloves forming the shape of a rainbow heart. We fell in love with the cute item, and had to find out if it’s a legit Disney product. At first, we couldn’t find them on the website, so we phoned Disney. We spoke to a woman named Serena, who didn’t know about the ears either, but after some digging, she found them in their database. An in-park exclusive release, the ears are called “Mickey Mouse Rainbow Love,” and are exclusively being sold at Disney World and Disneyland. The pride Mickey ears available at all four of the theme parks at Disney World, but the shops with the most quantity are at Magic Kingdom. Those shops are Emporium, Fantasy Faire and The Chapeau Hat Shoppe on Main Street. The hat is retailing for $17.99. 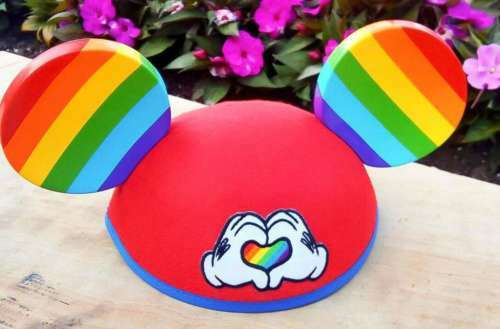 Queer Disney fans who can’t make it to the parks can call 407-939-5277 to order one over the phone and when prompted, ask for “shopping.” The item number for the “Mickey Mouse Rainbow Love” hat is 400020710710. Serena said the Mickey Mouse Rainbow Love hat was also available through the Shop Disney Parks app, as well as their online store, however, they didn’t come up when we searched. However, the hat has already made its way to Ebay, where it’s being sold for $29.99 plus shipping. Serena told us that there are plenty of hats in their warehouse, which means she foresees them carrying the item for sometime. It looks like Disney is gearing up for LGBT pride season right! Recently, Disney has made huge strides in their inclusion of the LGBT community. The Disney Channel achieved a historic first last year when it presented its first-ever coming-out story in the history of its broadcast. The coming out occurred in the series Andi Mack and involved a younger male character, 13-year-old Cyrus Goodman, who realizes he has his feelings for his friend, Jonah, and who subsequently came out as gay. Also last year, Disney’s live action remake of Beauty and the Beast featured a very gay LeFou. After director Bill Condon told Attitude there would be an “exclusively gay moment” in the film, conservatives stateside and internationally spoke out in protest against Disney’s step towards diversity. One Million Moms petitioned, an Alabama theater wouldn’t show the film, Russia banned kids younger than 16 from seeing it and Malaysian censors requested the scene be removed. Disney refused. We’re loving the LGBT inclusion that Disney is showing with their portrayal of LGBT narratives on screen and with the selling of this very cute pride item in their parks. The hat is a fantastic symbol of our LGBT pride and a fabulous way to celebrate our community this June.